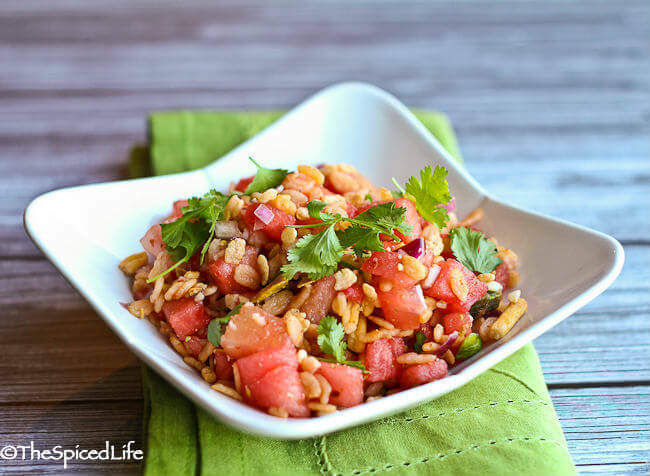 Watermelon Chaat is a juicy, crispy, salty-sour-sweet explosion of Indian flavors with American watermelon that can be eaten as a snack or a salad. Guys! I have exciting news! 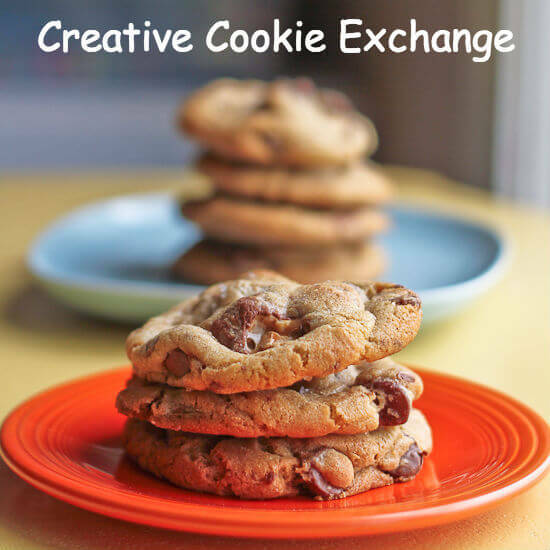 I am headed back to Eat Write Retreat next month! As you may remember, I attended its first 2 years, but due to finances I did not go last year. So I am super excited to be headed back this year, and in an all new location too! Philadelphia! In the meantime, attendees have been encouraged to create watermelon recipes for some video work that we will be doing with one of the conference’s great sponsors, the National Watermelon Promotion Board. No compensation or catch, other than I will be entered to win some goodies–and hey I don’t know about you, but when I brought this watermelon home my kids went bonkers. Bouncing off the walls with excitement bonkers. Between that and the fact that watermelon is seriously good for you, I am totally on board with creating a watermelon dish. At first I just put this on the back burner, wondering what I could think of that hadn’t been done before (like watermelon and feta, which I have done twice on this site before), but then I realized that literally, as I was thinking this, I was also busy putting together a trial run of a mango chaat dish. 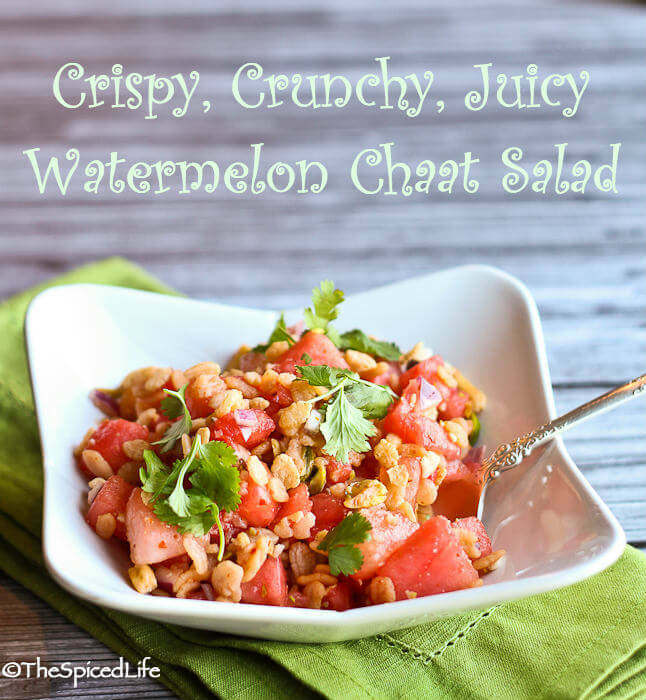 If you can have mango in chaat, then why not watermelon? No it is not traditional in India (to my knowledge), but it is juicy and sweet just like a ripe mango. 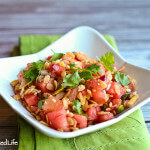 So the night after the trial run of a mango chaat, we had a trial run of watermelon chaat. Which went over really well I am excited to report! So I served this dish at my chaat themed get together last weekend (<–and be sure to check out that link if you want to learn more about chaat, an Indian snack food) and it went over really well! 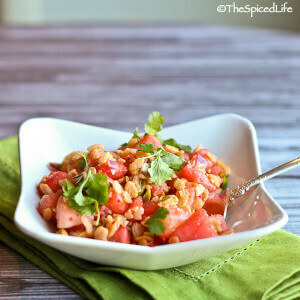 Because the watermelon is so refreshing, this is one chaat that can definitely be made a little spicy if you want to. 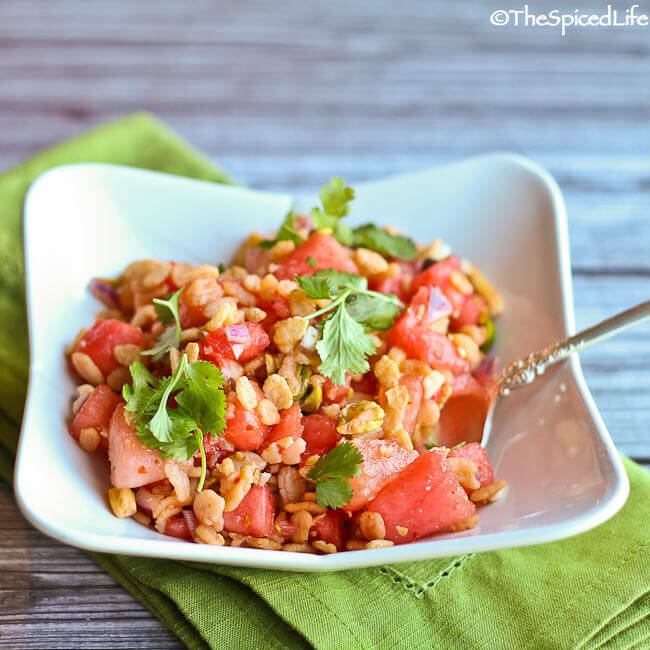 In an ideal world, it would be tossed together right before serving because the watermelon is so juicy. Do you remember those commercials for Rice Krispies where they referred to the “snap, crackle and pop” that you could hear as the puffed rice absorbed the milk? Well, it is the same with watermelon juice (and lemon juice), and I have read in some Indian cookbooks that that sound is the hallmark of some chaat dishes. My kids, not having grown up with those ads, were astounded at the sound!!! I personally find the crispiness of the puffed rice and fried gram flour noodles to be essential, but if you are making this for anyone with nut allergies you could leave out the pistachios in a pinch. Just add more of the crunchy noodles and crispy puffed rice. I prefer my chaat masala, but feel free to use a commercial one–on occasion I have doctored the MDH brand to my liking. If your fried gram flour noodles are not seasoned, be sure to add some cayenne powder as well. One last note: any time a recipe calls for raw red onion I soak it first. This will help eliminate the fumes that can cause an upset stomach. So dice the onion, then soak in cold water for 5-15 minutes. Drain and then use in recipe–get it as dry as possible, drain it really well. Everything about chaat is to taste, so feel free to increase or reduce any of these amounts. Toss together the dry ingredients. Set aside. Toss together the wet ingredients. Right before serving, toss the wet and dry together. Taste for additional cayenne, salt, lemon juice and/or chaat masala. *Here is an affiliate link to the exact brand that I used, but feel free to substitute any of the Indian crunchy fried snacks: Mirch Masala – Tikka Ganthia. We love Indian cuisine and this sounds delicious…can’t wait to try it! I am not familiar with those noodles… off tomorrow to my Indian grocer to hopefully track them down. I have recently made a fresh batch of chaat masala, so I am good to go 🙂 I am happy to give this a 5 star untried….just know it is going to be good. Thank you! And know that I am calling them noodles, but they are fried and crunchy, in a bag like a snack. Let me know how it goes! What a beautiful salad, love the addition of ganthia in it! What a fun challenge! Of course, the year you are going to EWR, I am not (because of financial reasons…weddings are expensive!). Anyways, I love how out-of-the-box you went with watermelon. Good luck with the contest! Looks delicious! I’ve never had chaat but I can’t wait to try. Lovely colors and photography too! Yum! this sounds incredible! pinned for watermelon season, I cannot wait to taste this! Such interesting flavors. I’ve never put all of these together, but it looks great! That looks and sounds summer- perfect!